In an effort to get something a little healthier than my beloved Salted Caramel Hot Chocolate at Starbucks I gave the Chai Latte a try. Not quite a SCHC, but pretty darn good, and quite an acceptable substitute. Last week at Trader Joe's I spotted a Chai Latte mix and almost bought it. Then I realized it was just tea and powdered milk. I love milk and I'm a purist. I just see no reason for the powdered stuff. I decided to to buy the chai tea bags and just wing it. Got something pretty close to what Starbucks serves on the first try and while their version is 160 calories for a tall, mine is about 50, thanks to a no calorie sweetener. It's a great bang for 50 calories. Filling, satisfying and the whole tea ritual thing makes it feel like quite a treat. 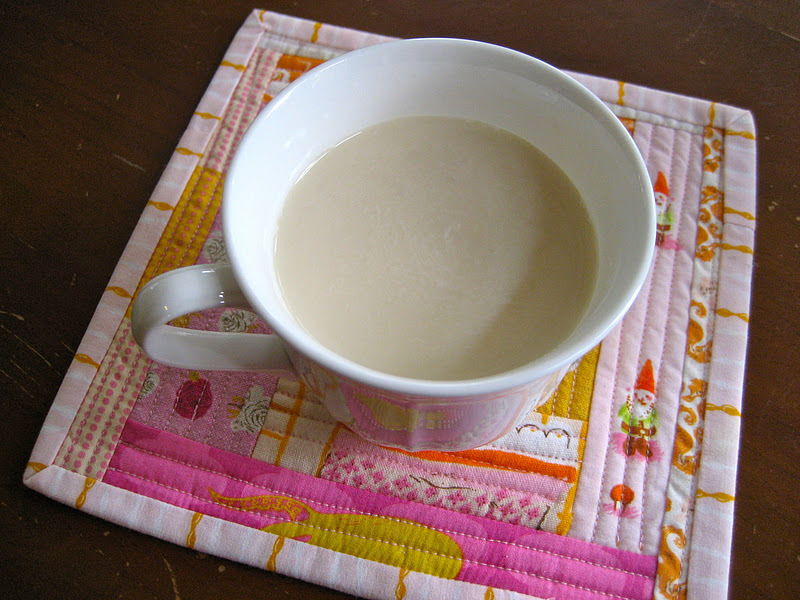 Heat water and milk in the microwave until very hot but not boiling. Almost 2 minutes for me. Pour into teacup with 1 chai tea bag. Allow to steep for about 3-4 minutes. Good opportunity to unload the dishwasher, right? Add sweetener, stir well and squeeze out the tea bag before discarding. Pretty yummy. For me, it was the perfect treat after Yoga this morning to tide me over to lunch (my kids both are in preschool this morning - yahoo!). Hope you enjoy. Oh, and as I have no experience making this, if I am doing something wrong that would make it better, ideas are welcome! I think it tastes pretty close to Starbucks, so I'm happy, but willing to tweak. Was actually wondering if maybe they use a little vanilla?